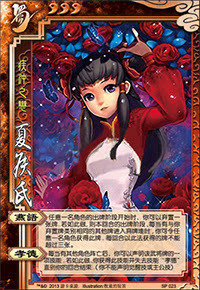 At the beginning of any player's turn, Lady Xiahou can discard a hand card. If she does this, whenever any player uses any hand card of the same type, she may take it and give it to any player. She may do this up to three times per turn. Whenever any other play dies, Lady Xiaohou can choose one of their powers. She then gains that power and loses Filial Piety until the end of her next turn. She cannot choose awakening abilities or king powers. Lady Xiahou does not have to discard a card at the beginning of someone's turn for "Swallow Birds", this is especially true if they are not expected to play any cards. The three types of cards are basic, tool, and equipment. To pick any up through "Swallow Birds", Lady Xiahou must first discard one of the same type at the beginning of that turn. After all the effects occur from the card, she is asked if she would like to use "Swallow Birds" on it. If she does, she can put it in any player's hand. Lady Xiahou can only use "Swallow Birds" three times per turn, but it does not need to be the first three cards that come out. She can hold out to find something better. The cards do not have to come from the person taking their turn. If she discards a basic, she can use any basic card that is used that turn for anyone. If someone attacks and another person escapes, she can take both the attack and the escape and move them. When Lady Xiahou discards an equipment card for "Swallow Birds", she would get the equipment that would enter the discard pile if something is replaced, broken, or lost by some power. She does not get to take something that a player is equipping. "Filial Piety" can only be used once per round. If more than one player die between Lady Xiahou's turns, she cannot take both of them. She must decide if she wants someone at the time of their death. After her turn, she loses that power and starts with a clean slate again. She can then take another power.